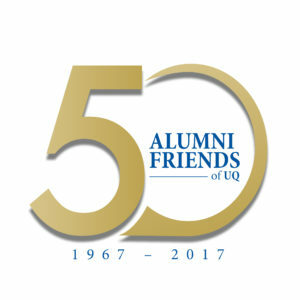 Alumni Friends of The University of Queensland Inc (also known as Alumni Friends and occasionally as AFUQ) dates back to 1967, when The University of Queensland (UQ) sponsored the formation of an association to foster relationships with UQ alumnae. The organisation was an ‘Australian first’, and we were proud to be celebrate our first fifty years in 2017-18. Alumni Friends aims to connect engaged alumni and friends to support the endeavours of the ‘future alumni,’ educators and researchers of The University of Queensland (UQ). Membership is open to everyone who has an interest in UQ: parents, students, alumni, and friends. Operated by a large group of dedicated volunteers, the association continues to raise significant funds through the very popular bi-annual Alumni Book Fair, and through donations and gifts from members. The close association of our members with UQ cannot merely be measured in dollar terms, but activity to date includes the disbursement of millions of dollars to the University and to its students (the equivalent of over $8 million as at May 2017). Special events: Our events program included special exhibitions (at the University Art Museum, at the Fryer and Social Sciences and Humanities Libraries, and at the R D Milns Antiquities Museum), a School of Music Concert at QPAC, and a special Gala Lunch. Visit our website for more information, or join our organisation to receive copies of our member newsletter (Alumni News). Investing and Giving Back: A special program of fund-raising to donate fifty $1,000 student bursaries to current UQ students. Sharing memories: Celebrating and sharing memories of connection with the University (including through the 50 stories project). A copy of the final report on the 2017-18 Golden Jubilee Program was tabled at the May 2018 AGM, and is available here. Why not join us? New members are always welcome. Membership is open to all members of the community who have an interest in the University (including, but not restricted to, alumnae). Members receive three annual newsletters, access to discounted UQ library membership, and the opportunity to participate in a range of social activities during the year. Many members also join some of our special interest groups, or become more actively involved as volunteers. Name Change History: Alumni Friends of The University of Queensland Inc was formerly known as The Alumni Association of The University of Queensland Inc. The association was formed in 1967 by the (then) Vice-Chancellor, Sir Fred Schonell and was the first of the many Australian university alumni associations subsequently formed. On 17th May, 2008, the association held a Special General Meeting which voted to change the association’s name to Alumni Friends of The University of Queensland Inc. This was undertaken to avoid confusion between the newly-formed UQ Alumni network being developed by the University. This name-change was subsequently approved by the Queensland Government’s Office of Fair Trading on 7th July, 2008.